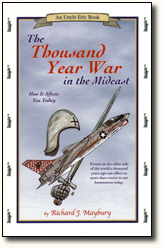 The Thousand Year War in the Mideast has been the cause of great shocks to our economy and investment markets. Oil embargoes, the Iranian hostage crisis, the Iraq-Kuwait war, the Caucasus Wars over the Caspian Sea oil basin, and September 11, 2001 are recent events in an ongoing war that began over a thousand years ago in the Mideast. Each has devastating effects on the world economy and investment markets. Unfortunately, the conflicts are likely to continue for decades to come. Mr. Maybury explains how events on the other side of the world that occurred a thousand years ago can affect you more than events in your own hometown today. To successfully manage your career, business, and investments it is imperative that you understand the political and social history of the Mideast. Forewarned is forearmed.